This book teaches the 5-string banjoist to listen and play solos and chord progressions by ear, providing essential ear training and techniques needed to participate in jam sessions of all types! Chapters include: Learning Chord Progressions by Ear; Faking a Solo; Playing the Melody by Ear; and Using Licks. This book presents a selection of original 5-string banjo tunes that can be played by the beginning student familiar with basic chords in G tuning. 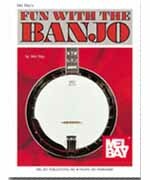 The author introduces a variety of styles and banjo techniques including hammer-ons, pull-offs, string bending and slides - all in standard notation and banjo tab.